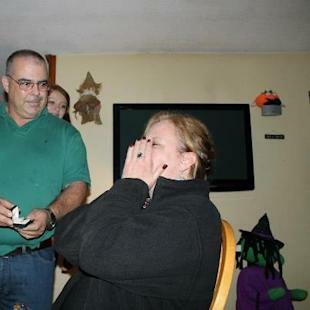 A woman from Bridgewater, Mass., got a very sparkly surprise just in time for her 21st wedding anniversary when she was reunited with her diamond engagement ring 17 years after she'd lost it. Valerie Lynch, 48, remembers removing her wedding bands to slather up her children with sunscreen at her sister's house as if it were yesterday. "I brought the kids who were 2 and 3 at the time, and my nephew was 4, to my sister's house in Plymouth, not far from the waterfront," Lynch told ABCNews.com. "I took off my rings to put sunscreen on them, and I put the rings on the platform by the slide on the swing set." Lynch had barely made it to the waterfront before realizing her rings were gone. "There were no cell phones back then. I flew back to my sister's place, looked all over the place. I was hoping it would be right there. I just panicked. I was freaking out about telling my husband," Lynch said. The following weekend, she enlisted the help of friends and family to scope the yard with metal detectors, but unfortunately never found the rings. But luck wasn't completely lost on Lynch. About a year and a half later, her sister, Vicki Belanger, 46, found the wedding band by itself glistening on the ground as the snow melted. "I was excited about that, but never found the actual engagement ring," Lynch said. Fast forward 17 years later. Enough time had passed for Lynch to give up all hope of ever locating the diamond ring. 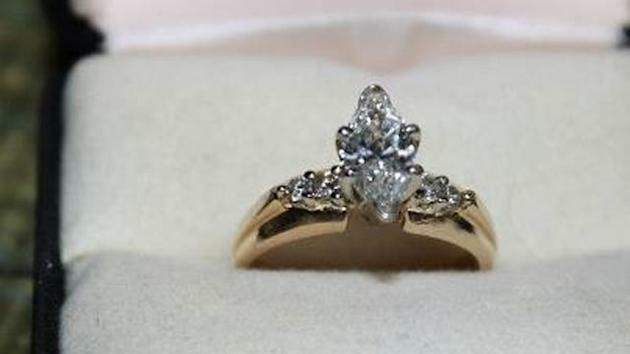 But thanks to a chance encounter her sister had with Kent Blethen, a jewelry-hunter enthusiast with Silver City Treasure Seekers, the diamond ring was finally found, and kept a secret from Lynch for nearly a week. "I had met this man through a friend who just said he looks for missing jewelry for people," Belanger said. "It's a fun hobby for him. I mentioned my sister's ring and never thought more of it. But he texted me a couple of weeks later and asked if I wanted him to find it." So on Oct. 28, in one last Hail Mary attempt, the two scoured the yard and couldn't believe their eyes when they actually found the diamond ring. "He found it within 40 minutes. I was shocked. It was about an inch under the ground. I kept it a secret from her for about a week," Belanger said. "All I said to her was that she had to trust me. That she needed to be at my house that week. She kept asking me why. I just refused to tell her because I'm really bad at keeping secrets." Lynch didn't like secrets and was very apprehensive about why her sister needed her to make the 30-minute trip to her house. But she finally gave in the following Friday, Nov. 2, and was shocked by all the cars she saw on her sister's street. Belanger had arranged for the local newspaper to be there for the ring's return. "I saw this line of cars and saw a gentleman who said, 'You don't know me. But did you ever lose something?' I said no," Lynch explained. "He said, 'A long time ago,' and then it started to come into my brain. And then he presented it to me in a ring box. I started bawling. It was my ring, and he had it all cleaned and beautiful and gorgeous." She continued: "I just was beyond beside myself. I had no idea what my sister was telling me to come down there for. It was so off my radar. I had completely forgotten about it because there was no hope. I was just thrilled." In all the years it was missing, Lynch had never replaced the ring. "It never felt right to replace it. It was too special," she said. Her husband, Mike, was also relieved to hear the ring was found. Now he's off the hook for their wedding anniversary on Nov. 9. "He was absolutely thrilled. My 21st wedding anniversary is Friday, so it's awesome timing," Lynch said. When asked if she was ever going to take her rings off again, Lynch said, "No, absolutely not. It's not coming off."